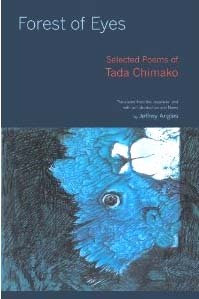 One of Japan's most important modern poets, Tada Chimako (1930-2003) gained prominence in her native country for her sensual, frequently surreal poetry and fantastic imagery. Although Tada's writing is an essential part of postwar Japanese poetry, her use of themes and motifs from European, Near Eastern, and Mediterranean history, mythology, and literature, as well as her sensitive explorations of women's inner lives make her very much a poet of the world. "Forest of Eyes" offers English-language readers their first opportunity to read a wide selection from Tada's extraordinary oeuvre, including nontraditional free verse, poems in the traditional forms of tanka and haiku, and prose poems. Hiroaki Sato has written an essay about her with some of her haiku translated, for the journal "Roadrunner." 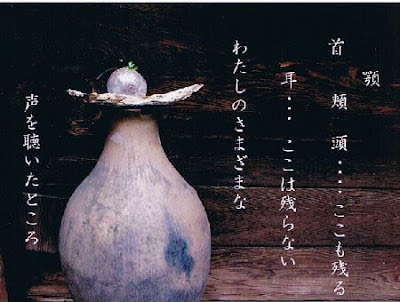 In the last year of her life, the poet Tada Chimako (1930-2003) wrote haiku under the guidance of another poet, Takahashi Mutsuo (born 1937). This came about not just because the two poets admired each other... . It also came about because Takahashi is one outstanding exception in Japan. THere the reverence to specialization holds in poetry-writing as well, so that those who write tanka are called 'kajin', those who write haiku 'haijin', and those who write "poems" that belong to neither genre 'shijin', and each of the kajin, haijin, and shijin do not usually pursue the others' genre. In this milieu Takahashi, who started out as a shijin, went on to cover the genres of tanka and haiku, and won major prizes in all three branches. ....it was only after [Tada] was found to have cancer, in November 2001, that she decided to try her hand in haiku. We do not know why she did so, but the haiku she composed over a period of about a year while she was heading toward death turned out to be what Takahashi calls a "sickbed diary." ... [Tada] had a fine sense of style backed up with erudition and a solid grasp of what was possible in the sharply confined genre of haiku. 'Kaze no katami' (A Wind's Mementos). Heading to the first haiku. It refers to the fact that 'cancer' is the name of a constellation and as a sign in the Zodiac is the Latin for "crab," and is also the disease so named. The haiku that follows is hypersillabic, with "Shishi-za," Constellation Leo, adding three syllables. ['Tsuwabuki'] 'Farfugium japonicum': a plant with bright yellow daisy-like flowers that bloom over roundish, fleshy leaves. ['Kusurimizu'] A train station in Nara. So named because it is near a well-spring named after Kusurimizu Daishi, one of the names of the Buddhist proselytizer Kuukai, Kooboo Daishi (774-835). the water is like steel. ['kagomakura'] A pillow made of wicker or bamboo. Tada attended Tokyo Women's Christian University, and later taught European Literature. She wrote this haiku shortly before her death. Thank you. I enjoyed learning of and reading this imaginative kajin, haijin, and shijin. An important modern voice.